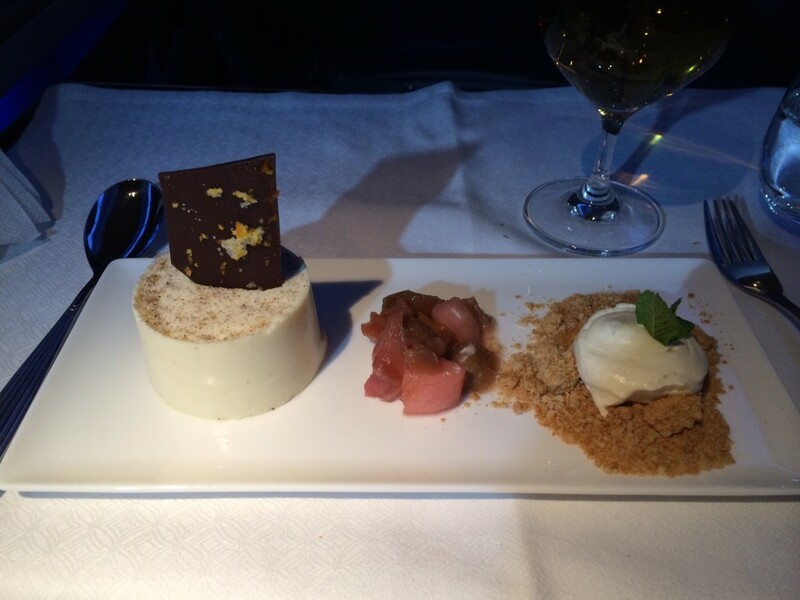 This is Part 2 of my review of the Qatar Airways Boeing 777 business class service from Heathrow to Doha. This was a day flight and Qatar did not offer any pyjamas. This was a little annoying as I was planning to use them in the hotel! The toiletry bag was branded Ferragamo. There are separate male and female versions, the female one is white. 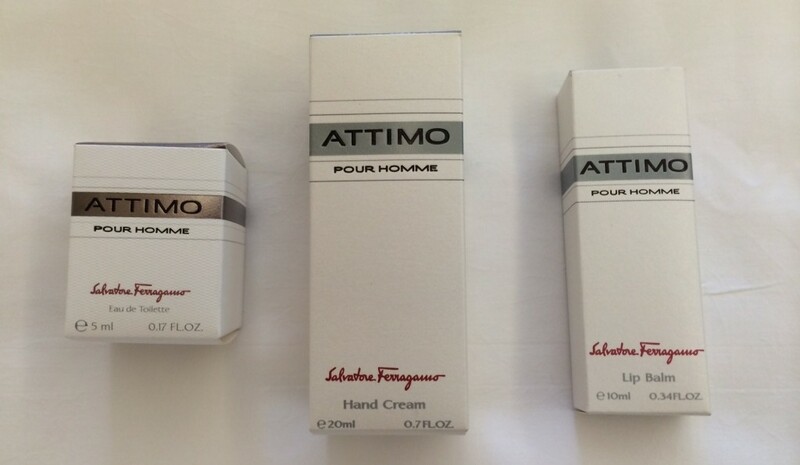 It only contained three items – 5ml Ferragamo Attimo Pour Homme EDT, 20ml Ferragamo Attimo Pour Homme hand cream and 10ml Ferragamo Attimo Pour Homme lip balm. Razors, shaving cream, toothbrushes and toothpaste were available in the toilets where you could help yourself. As my review of the Qatar Premium Lounge showed, the airline does appear to be serious about its food. It has its own roster of consultant chefs as is the norm these days, with the menu marked to show who has designed each item. Having had teriyaki chicken in the lounge a few hours earlier, I went with the monkfish. 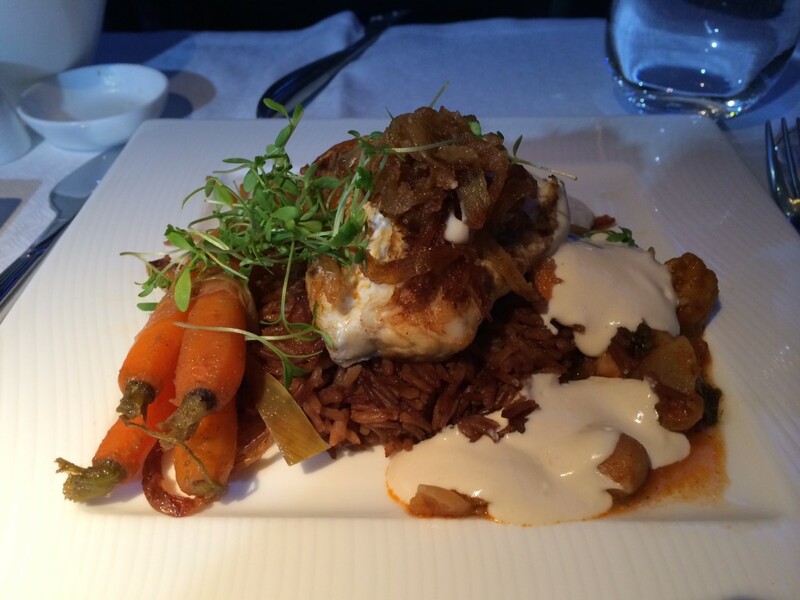 It was an excellent choice – as you can see from the carrots, Qatar did seem to be making a real effort with all aspects of the dish. The mild spiciness of the monkfish overcame the dulling sensation that your taste buds experience in flight to ensure that the food did still deliver a kick. It also came with a selection of bread which did actually taste and feel like bread! I went with the panna cotta, which did the job. 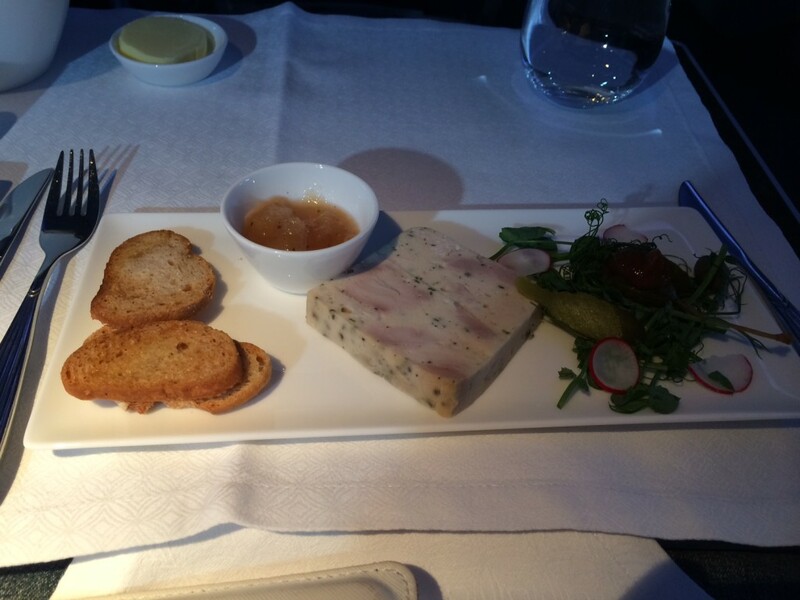 Overall, the food was certainly on a par with what I received in British Airways First Class a few weeks ago. The wine list on-board is different to what is served in the Heathrow lounge, which itself is different to what is available in the Doha lounge. Champagne is Lanson (Vintage 1999) or Taittinger Prestige Rose. Both sell for around £40 at retail price. There were also three white and three red options plus a Tokaji dessert wine from Dereszla (2008) and a 1974 Tawny Port from Kopke. If you judge a drinks list by its whisky offerings, you are looking at Chivas Regas (12 years), Glenfiddich (15 years) and Jack Daniel’s. The Qatar IFE system is called Oyrx, after the antelope variant which features on their logo. As with any modern IFE system, there was a very large range of films, TV and music available – the website claims there are over 1,000 programmes to enjoy. I spent my time watching the TV series Veep which I had never managed to catch before. If I had a criticism, it did seem to be lacking in current blockbuster movies. You can’t question the breadth or depth of their selection, with movies available in pretty much every major language and from every genre, but it you boarded with a mental list of recent movies you wanted to watch, you may be disappointed. You will definitely find something to interest you though – on the way back, I watched a documentary about the history of Amazon (the dot com, not the river). There is no in-flight wi-fi on the 777’s. It was available on my Boeing 787 on the return although it is not free and I found the price a little steep. 6 hours and 30 minutes later, at 00.45 Doha time (two hours ahead of the UK), we arrived at the new Hamad International Airport. There was an interesting moment as we waited to deplane. The ground staff were struggling to open the front door, so the stewardess who was in charge of that door moved down to the centre doors instead. Suddenly the ground staff managed to release the catch on the front door and knocked on the window to tell the remaining stewardess to open it. She said that she did not have authority to open the door, presumably because she had not personally disarmed it. The captain (who was British) had joined us by the doorway at this point. As he has overriding authority to open any door on the aircraft, he personally swung it open – after getting an assurance from the stewardess that it had been disarmed by her colleague! 30 seconds later I emerged into Hamad International. In all honestly, my initial reaction was “s**t”. It is huge – it must be one of longest man-made structures on earth. I remember saying to myself that there is zero chance that I will ever see an airport terminal like this in the UK in my lifetime. More on Hamad later in this series. My immediate destination was the St Regis hotel in Doha. I flew with Qatar to Beijing in September & was very impressed, although I would agree with your point that the selection of recent films could be better. Some of the flight times aren’t great, however one option is stay overnight at the hotel in the Hamad terminal which is very conveniently located – since it is past security you can just go straight to the gate from your room shortly before departure. Given that they seem to be very competitive on price as well (a business seat was almost half the price of BA for the flights I took), I’ll definitely consider them for the future. I think you’ve given a fair summary of the Qatar experience, Raffles. The inconsistency in seating reminds me of Emirates five years ago, although it’s good that they don’t have the miserable centre seat in business class. But for the price, they really are good value when transiting to more obscure parts of Asia. I’ve gone for the A380 out and back next month, looking forward to that. I’m surprised you weren’t offered pyjamas on a day flight, I always have (and the sizing is atrocious). As for the door, maybe there’s something in their operating procedures that also requires two crew to be present. At my usual Emirates destination they deplane a 777 through stairs at the front and back, so I’ll sit at the back and reassure the crew that I am heading in the right direction! Two of them have to be at the door to open it. So… there you go. Door opening procedure: each crew member is allocated to a specific door, and only they can arm/disarm it. On landing each disarms their own door and need another crew member to cross check that the other’s door is indeed disarmed. However, a crew member can only open their door in the presence of a senior (includes captain). This procedure is a bit of a drag especially if the senior walks off as happened in this case, but it helps prevents slides being blown, injuring ground staff and causing $$$$$ worth of damage. Re: pyjamas on a day flight and poor toiletry kit offering: perhaps Qatar is cost-cutting?? Thanks for this Rob. As you know I was booked into F on QR2 a year out in the hope of flying a 380. With the repeated delays in delivery this looked unlikely to happen so I rebooked onto MH. With hindsight this would appear to be the right choice and I would ultimately have missed the A380 by two days unless it is delayed yet again. From your review I find nothing particularly appealing about Qatar Airways other than the lounge. I dislike 777s full stop, they are noisy and QRs business class layout does nothing for solo travellers. I accept you found food to be good but the menu was limited and uninspiring; was it M&S Dine In for 2? I would say A330s and A340s are an advantage for economy travellers as the layout is better and cabin ambiance much nicer. I believe A330 business class is being retrofitted but not sure with what. I think it was very bad form for Qatar to operate one LHR rotation with a 380 and one with a 340, the only other with F. They should have waited until thry had both A380s to begin, or the A340s or a 777 should have been upgraded with similar products. Another downside of Qatar and other Gulf carriers, especially from the regions, is that middle of the night or very early morning transits are almost inevitable. I don’t line this myself and cannot imagine the stress it places on families with young children in economy class. Before changing my flight I called Qatar to inform them I was a disabled passenger and would require assistance with my transit in Doha. I was unimpressex to be told that this was a chargeable service and I would need to contact another company myself to arrange it. Given this, ny disappointment over A380 and unsociable transit hours I am in no hurry to try Qatar in the future. They like to market themselves as a 5 star airline; as a conclusion to your series of reviews it would be interestung to hear whether you feel Qatar merits such lofty claims. When i first saw the pics of the seat i thought it looked very similar to the business seat on MAS A380, perhaps designed off the same basic seat. Although the seat on MAS is (almost) fully flat. With Qatar flying out of Edi i was quite interested in using them, however the connection time in Doha can be either very short or very long. Yes, I heard a few people complain about rush for connection from EDI. QR were supposed to be going daily and rventually double daily from EDI but never heard anything more about that. Perhaps Etihads entry put a stop to that. I would be much more interested if they offered a night flight departing EDI at 10pm or later. Redemptions on QR to SE Asia in C are also pricey at 80k miles each way so given I’m finding it increasingly difficult to collect avios I prefer BA via LHR despite fees. Note that from much of Europe to Doha (Frankfurt, Zurich, Vienna etc) it is only 25,000 each-way in Business on Qatar compared to 40,000 Avios each-way from the UK. Yes, that’s true and useful for some routes. Unfortunately less helpful to se Asia where most destinations ow J fall into 40000 band so we are looking at 65k plus reward flight saver or position flight. Could be good if taking advantage of short break but less so if simply going A-B. QR charging passengers for disability transit assistance in Doha is not exactly friendly or ‘fair’ (in an equal opportunities way). In other international airports, I assume it is the airline concerned that pays the service provider for transit assistance, is this right? Do any other airlines charge for this? Is the fee nominal or significant? I don’t know what the fee was as it was final straw for me. I declined and changed to M H. To be fair I am not sure if it applies to all disability assistance or if it was because I declined wheelchair assistance and only asked for somebody to walk with me. I am visually impaired and generally manage fine myself but first time in an airport or with tight connection I usually seek assistance. Whatever the detail of their policy I was asked to pay for the assistance myself and arrange it with a separate company myself. I have been flying over 30 years and I think over 20 fifferent airlines; it has never happened before. Only thing sumilar I seem to recall was maybe Ryanair charging for wheelchairs or something likr that in the past. What normally happens us that airports charge a small PRM fee per pax (able-bodied and disabled) which is supposed to cover the cost of any mobility issues/requirements. Therefore hypothetically a 777 full of young, fit athletes would be charged the same as a 777 full of coffin-dodgers on a one-way to Dignitas, even though their PRM needs would be wildly different. Well – as we know QR is reading this – time you guys got into the 21st Century. The rest of us – ie the currently able-bodied – are perfectly prepared to pay a little bit more so that anybody with disability needs is taken care of at no personal cost. Thanks to you and Tim for comments. To be fair most airlines and airports are generally great most of the time in my experience and I have no reason to believe QR and Doha are any different. I believe they probably have their policies and procedures but I requested something that fell outside them. I guess how airlines choose to pass on the PRM fee that the airports charge them is their choice but most people wouldn’t notice extra YQ of £2-3 but those with restricted mobility would certainly notice it if airlines choose to pass it on only to those who require it. I have gone for a Qatar Business Class return Paris – Saigon over New Year at £1400 i think its a good value. Now just have to get to Heathrow on Boxing day for an early flight to Paris and pray for no snow!